the clear, transparent anterior covering of the eye (see also color plates). The cornea is subject to injury by foreign bodies in the eye, bacterial infection, and viral infection, especially by the herpesvirus that causes herpes simplex. The herpesvirus that causes herpes zoster (shingles) can also infect the cornea. Prompt treatment of any corneal injury or infection is essential to avoid ulceration and loss of vision. The transparent tissue constituting the anterior sixth of the outer wall of the eye, with a 7.7-mm radius of curvature as contrasted with the 13.5 mm of the sclera; it consists of stratified squamous epithelium continuous with that of the conjunctiva, a substantia propria, substantially regularly arranged collagen imbedded in mucopolysaccharide, and an inner layer of endothelium. It is the chief refractory structure of the eye. The transparent convex anterior portion of the outer fibrous coat of the eyeball that covers the iris and the pupil and is continuous with the sclera. the convex, transparent anterior part of the eye, comprising one sixth of the outermost tunic of the eye bulb. It allows light to pass through it to the lens. 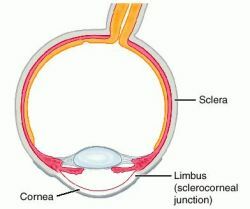 The cornea is a fibrous structure with five layers: the anterior corneal epithelium, continuous with that of the conjunctiva; the anterior limiting layer (Bowman's membrane); the substantia propria; the posterior limiting layer (Descemet's membrane); and the endothelium of the anterior chamber (keratoderma). It is dense, uniform in thickness, and nonvascular, and it projects like a dome beyond the sclera, which forms the other five sixths of the eye's outermost tunic. The degree of corneal curvature varies among different individuals and in the same person at different ages; the curvature is more pronounced in youth than in advanced age. corneal, adj. The transparent tissue constituting the anterior sixth of the outer wall of the eye, with a 7.7-mm radius of curvature as contrasted with the 13.5-mm radius of the sclera. It consists of stratified squamous epithelium continuous with that of the conjunctiva, a substantia propria, regularly arranged collagen imbedded in mucopolysaccharide, and an inner layer of endothelium. It is the chief refractory structure of the eye. The outer, and principle, lens of the eye through which the coloured iris with its central hole (the pupil) can be seen. The cornea performs most of the focusing of the eye. Fine adjustment (ACCOMMODATION) is done by the internal crystalline lens. that part of the SCLERA at the front of the eye of vertebrates overlaying the iris and lens. It is a transparent layer of EPITHELIUM and CONNECTIVE TISSUE through which light enters the eye and is refracted so that the lens can then focus it on the retina. The cornea contains no blood vessels, oxygen coming directly from air dissolved in tear secretions, and is therefore easy to transplant as no tissue-typing is required. Clear, bowl-shaped structure at the front of the eye. It is located in front of the colored part of the eye (iris). The cornea lets light into the eye and partially focuses it. The transparent anterior portion of the fibrous coat of the globe of the eye. It has a curvature somewhat greater than the rest of the globe, so a slight furrow marks its junction with the sclera. Looked at from the front the cornea is about 12 mm horizontally and 11 mm vertically. It is the first and most important refracting surface of the eye, having a power of about 42 D. The anterior surface has a radius of curvature of about 7.8 m, the posterior surface 6.5 mm, and the central thickness is about 0.5 mm. 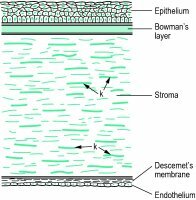 It consists of five layers, starting from the outside: (1) the stratified squamous epithelium; (2) Bowman's layer; (3) the stroma (substantia propria); (4) Descemet's membrane; and (5) the endothelium. The cornea is avascular, receiving its nourishment by permeation through spaces between the lamellae. The sources of nourishment are the aqueous humour, the tears and the limbal capillaries. The cornea is innervated by the long ciliary and other nerves of the surrounding conjunctiva, which are all branches of the ophthalmic division of the trigeminal nerve. Innervation is entirely sensory. Within the cornea there are only unmyelinated nerve endings. The density of nerves in the cornea is very high, making it the most sensitive structure in the body. The major structural component of the cornea is collagen, mostly type I, and most of the ground substance between the collagen fibrils in the corneal stroma is proteoglycans whose core proteins bind with keratan sulfate and dermatan sulfate (chondroitin sulfate B). The cornea owes its transparency to the regular arrangement of the collagen fibrils, but any factor that affects this lattice structure (e.g. swelling, pressure) results in a loss of transparency. The cornea contains some 78% water, some 15% collagen and some 5% of other proteins (Fig. C18). See endothelial bedewing; corneal stroma; corneal topography; dellen; deturgescence; dyskeratosis; glycosaminoglycan; keratitis; keratomycosis; Hudson-Stahli line; Bowman's layer; Descemet's membrane; microcornea; specular microscope; optical zone of cornea; pachometer; Maurice's theory; Hurler's syndrome; videokeratoscope. cornea farinata A bilateral corneal degeneration characterized by faint dust-like opacities in the deep stroma. They do not impair vision and are usually age-related. cornea guttata Dystrophy of the endothelial cells of the cornea which may result from corneal trauma, cataract surgery, keratic precipitates, tonography, ageing, continuous contact lens wear, or as part of the early stages of Fuch's endothelial dystrophy (a disease associated with ageing and with females more than males). It is seen clinically by slit-lamp examination as black spherules in the endothelial pattern. The condition is bilateral, although one eye may be affected more than the other. As the condition progresses the cornea becomes oedematous with a consequent loss of vision and eventually turns into bullous keratopathy. If the degenerated cells are located at the periphery of the cornea they are called Hassall-Henle bodies and are of no clinical significance except as an indication of ageing. Syn. corneal guttae; endothelial corneal dystrophy. See specular reflection illumination; keratic precipitates. optical zone of cornea See optical zone of cornea. cornea plana A rare, congenital, usually bilateral condition in which the corneal curvature is flatter than normal with a significant decrease in refractive power. The eye is usually hyperopic with a shallow anterior chamber often resulting in angle-closure glaucoma. 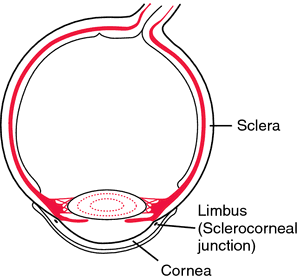 There is some degree of peripheral scleralization and it is closely associated with sclerocornea. Transparent tissue constituting the anterior sixth of the outer wall of the eye, with a 7.7-mm radius of curvature. n the transparent anterior part of the eye. the clear, transparent anterior segment of the fibrous tunic of the eye. The cornea is subject to injury by foreign bodies in the eye, and bacterial and viral infections. See also corneal, keratitis, keratopathy. a congenital flattening of the cornea. Q. Has anyone had experience with a corneal transplant because of keratoconus? One of the most common reasons for a cornea transplant is a condition called keratoconus, which causes the cornea to change shape. This surgery transplants the affected front area of the cornea with a healthy layer imported from an eye bank in the United States. Many people in Oman who are suffering from infections in their corneas need transplants, but only a few are being admitted to Omani hospitals due to eye injuries. Although there are some differences between the human and rabbit cornea in the recovering of endothelial function (faster in rabbits thanks to cell proliferation), the efficacy of stem cell treatment of alkali-injured cornea on the renewal of physiological levels of corneal hydration and on the restoration of transparency compared to untreated injured corneas or injured corneas treated with nanofibers free of cells was clearly shown in our rabbit model. The cornea consists of the epithelium, which are the cells in the outermost layer; the stroma, which is comprised of connective tissue cells; the endothelium, a single layer of cells whose primary function is to maintain the cornea in a dehydrated state to help achieve optical clarity; and the Descemet's membrane, a thin, strong tissue that protects against infection and injury. Surgeons often seek the youngest corneal tissue available regardless of patient age but historically, some surgeons set extremely restricting upper age limits, NIH said, and pointed out that when the study began in 2000, many surgeons would not accept corneas from donors over 65. Having identified this new and distinct layer deep in the tissue of the cornea, we can now exploit its presence to make operations much safer and simpler for patients. Before evaluation, cornea should be allowed to come to room temperature. Transplantation of a donor cornea is the therapy of choice for a great number of those patients. Corneal Collagen Cross Linking is a technique that strengthens the chemical bonds in one's cornea by applying Vitamin B2 followed by treatment with UV Light. STEM cells, the body's "building blocks", are taken from the cornea of a dead donor and grown in a lab for around two weeks.